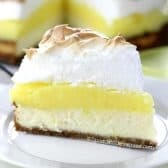 Lemon Meringue Pie is a classic dessert… Graham crust, creamy tart lemon filling with a fluffy meringue topping. This recipe combines all of those amazing flavors with a rich and lush cheesecake for a dessert that will top your list! Combine melted butter & graham crumbs. Press into a 9″ springform pan. With mixer on medium, beat cream cheese & sugar until blended. Mix in eggs. Pour cream cheese mixture over crust and bake for 35-40 minutes or just until center is set. Cool 5 minutes, run a butter knife around the edge to loosen. Cool on the counter 1 hour. Refrigerate 4 hours or overnight. Combine sugar, cornstarch, egg yolks and water in a large saucepan. Whisk constantly over medium heat until mixture reaches a boil. Stir in 1/2 cup lemon juice & zest from 2 lemons. Let boil 1 minute while stirring. Remove from heat and stir in butter, keep warm. Beat egg whites & cream of tartar on medium-high until soft peaks form (ends of peaks will curl when the beaters are lifted out). Continue mixing on medium-high adding in sugar a little bit at a time until stiff and glossy peaks form (about 5 minutes). Spread lemon filling over cheesecake layer. Immediately spread meringue over hot lemon filling. Be sure the meringue overlaps the edges of the pan slightly to avoid it shrinking. Bake 10-15 minutes or until browned. Cool at room temperature 1 hour. Refrigerate 4 hours or overnight before serving.